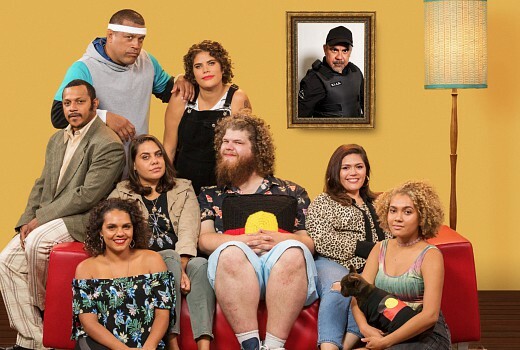 Indigenous sketch series Black Comedy returns for its third season on ABC soon. Written and performed by Indigenous artists the cast includes Aaron Fa’Aoso, Nakkiah Lui, David Woodhead, Nayuka Gorrie, Bush Tucker Bunjie Gabriel Willie, Wayne Blair, Rarriwuy Hick, Dalara Williams and 18 year-old newcomer Maci-Grace Johnson. Guest appearances include Elizabeth Wymarra, Leah Purcell, Adam Briggs, Matt Day, James Fraser, Jack Charles, Elaine Crombie, Lisa Hensley, Meyne Wyatt, Mia Wasikowska, Adam Goodes, Christine Anu, Jay Laga’aia, Daniel Amalm, Zoë Coombs Marr, Casey Donovan, Ian Roberts and Simon Hall. New characters include Bondi Blackfella, a lifesaver who’s more at home on the land than in the water, the Boomerang Brothers, a pair of unlikely identical twins with an even more unlikely discount store, Aunty Mary – a beautician of questionable talent, Trent, a young man who can’t quite live up to his own myth, the Wigglymuyu Dancers, a traditional dance troupe who perform their not-so-traditional dances against the backdrop of Sydney Harbour – and Tash, Nicole and Tyrone, the occupants of Melbourne’s blackest, and loosest sharehouse. We also meet Mark, a Torres Strait Islander man who survives a plane crash only to find himself marooned on a desert island with the whitest white people of all time, we pay homage to the 70s horror classic the Exorcist with the Cuzorcist as a priest tries to rid a family home of an unwanted cousin, we sit in on a Monopoly game that takes a very sinister twist when Nikki’s white boyfriend decides he’s going to take the game a little too seriously, we hit the streets with a detective as she blows the lid off the illegal Confirmation of Aboriginality trade in COA, we spend a night with a white businessman and high class call girl as he lives out his ultimate fantasy – an Indigenous Girlfriend Experience -and we revisit the men and women of Blakforce SCU: Special Coconut Unit as they try and identify a mole in their ranks. 9:30pm Wednesday September 19 on ABC. i commented on another story that we need a decent sketch comedy show on tv, but completely forgot about this brilliant show, do we know why they didn’t produce a series last year?